THE SKINNY: I am about to make every girl under the age of 14 really upset, but the premier scent by One Direction stinks. 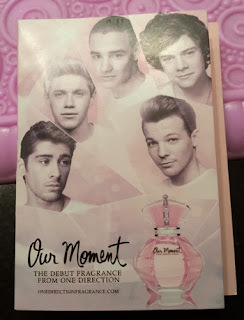 My first impression of Our Moment by One Direction was a strong smell of rubbing alcohol. I sprayed (and sniffed) again. Same smell. After a couple of minutes the scent shifted to something floral mixed with baby powder. Not attractive. Not grown up. Not something I will ever spray again. Thankfully, the scent disappeared quickly. It was so bad, that I actually laughed out loud when I saw the price. So sad. CHECK IT OUT: Learn more about Our Moment by One Direction or find it at Ulta (if you dare).